OXFORD, Miss. – Eighteen University of Mississippi students are ready to assist in health screenings in rural Delta communities, thanks to a recent training workshop. The Community Health Advocate training workshop was organized for the UM Center for Population Studies as part of the Society and Health academic minor and Society and Population Health class. 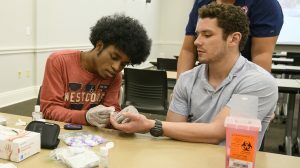 Led by UM Medical Center physicians, the students and two faculty members were trained and certified in how to take and record blood pressure measurements, blood glucose levels and body mass index measurements. They also learned the protocols of what to do when a person may present abnormal levels or measurements. As certified CHAs, the students are able to assist health care professionals in doing screenings at various health events planned for the Mississippi Delta. These new CHAs also will be networked into other volunteer opportunities that may be posted as part of Volunteer Oxford’s Give Gab page. “At the center, we have some events planned for students to use their skills and know of other volunteer events they can use their skills for events associated with the Flagship Constellations Initiatives and other community engagement programs and projects,” Green said. This is the second year that some of Green’s students participated in CHA training organized by the center as part of the Society and Health minor. Dr. Alan Penman, professor of preventative medicine in the School of Medicine at the UM Medical Center, conducted the lecture portion of the training and was joined by Robin Wilkerson, professor of nursing and assistant dean for the School of Nursing on the Oxford campus, and some nursing faculty and nursing students to assist with the skills portion. For more information about the SOHE minor, visit http://sohe.olemiss.edu/.